219 customers found this review helpful. Did you? Yes, I did! It makes Sunday roast a must.A little bit on the heavy side once you've got a big joint in it.The best part of it, is from the oven straight to the table..as it is such a lovely looking piece of cookware. 477 customers found this review helpful. Did you? Yes, I did! Just love my Copper Roasting Pan, not only is it great for standard roasting such as joints, it is versatile enough for lasagne, pies etc. and combined with the lid is one of the most used pans that I own. 456 customers found this review helpful. Did you? Yes, I did! The lid on this pan is greatly useful, roasted vegetables with the lid on, and chicken without the lid, they both tasted amazing compared to using regular stainless steel pans. Wish a wider one could be manufactured. 415 customers found this review helpful. Did you? Yes, I did! I have used this for roasting as well as an impromptu fry-up vessel when more people wanted breakfast than I bargained for. I am sure if QPR turned up on my doorstep after a training session I could rustle up a large stew for them as it holds tons. As for the quality of the cooking..... well, let's just say it's great. And build quality? I have no doubt my grandchildren's grandchildren will thank me for buying this. 470 customers found this review helpful. Did you? Yes, I did! Well made - does the job well. 459 customers found this review helpful. Did you? Yes, I did! Wow!! this piece is superb!!! It's reassuringly solid, reliable and distributes the heat extremely evenly. I have had roasting pans before where there seems to have been an obvious hot spot when cooking things like roast potatoes in the same pan that have produced variable results. With this fantastic roasting pan I produced the best roasties ever...all lovely and golden and crisp!!! thank you so much Faulk Culinair. Your customer service is superb too. I will be back to build my collection. My wife is going to cook lasagna in this roasting pan and is going to look beautiful when is served on the table. It is pretty deep so it will be a big portion this time. I appreciate the handles being completely vertical to make it compact and easier to fit in the oven and carry the weight of the pan itself plus you are cooking. NICE TOUCH! 549 customers found this review helpful. Did you? Yes, I did! Very pleased with this. Since buying it 3 weeks ago I have tried roast chicken, pork and beef in roasting pan. I love the way everything in the bottom of pans stirs into gravy afterwards which simmers away perfectly on the hob. Wow! I bought this superb Roasting Pan together with the 28cm Saute Pan as a Christmas present for my husband. If our saucepans are anything to go by, they will be an absolute dream to cook with! I recently purchased the Roasting Pan in the summer sale, which I had been ogling for months and didn't know if I could justify the expense. Oh my god I am sooo glad that I did. I can't figure out what I prefer, the beauty and thrill of cooking with it, or the ease with which it is washed up. I recently cooked a pomegranate molasses glazed roast chicken, with glazed onions as well and once I had finished cooking I could see all the burnt, black bits and was a little nervous about how I was going to clean it.I left the pan with a few centimetres of water in while we ate dinner, then 15 minutes returned to wash it up and it washed clean with near enough no effort on my part. This is now my 6th purchase from Falk and I could not be more impressed with the impeccable service provided by Neil.These have literally changed the way I cook and made cooking with them something that I look forward to every day. I am really impressed with the heat distribution with the roaster on a gas hob. I browned the meat for a hot pot successfully in the roasting pan, which also saved on washing up. Great to have a lid too, for the cooking and reheating of dishes. Love being able to put the roasting pan straight from the oven to the table. 424 customers found this review helpful. Did you? Yes, I did! Like other Falk products, this is a versatile piece, great for cooking large quantities of lasagne or other bakes for a party; it looks good for serving them, too. Roast potatoes or even oven chips really cook more quickly in this than in a steel tin and they turn exceptionally golden and crisp - the pan is worth having for these alone. The juices from a roast are easy to mop up for a flavourful gravy and it is stable and easy to handle with a large piece of meat in it. I hesitated about buying this because of the price but I am glad that I went ahead and bought it. 452 customers found this review helpful. Did you? Yes, I did! 448 customers found this review helpful. Did you? Yes, I did! This purchase was my first venture into Falk cookware and results from this roasting pan have been brilliant, each Sunday for winning roast dinners! Also, the roasting pan, has been to date a breeze to clean afterwards perhaps because of the satin finish on the inside? The cast iron handles are also very comfortable to use and manoeuvre in and out of the oven. The size of the pan is useful though could be even larger to accommodate just a few extra roast potatoes! 530 customers found this review helpful. Did you? Yes, I did! When I read about roasting pans, advice always includes thick flat base. Well, this ticks that box. 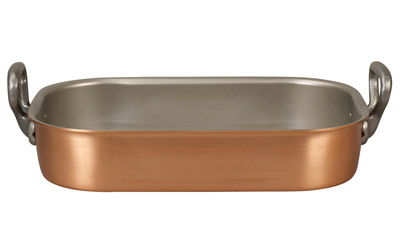 All the other attributes of Falk copper apply to this pan - good to look at, fit for purpose and easy to look after. Wonderful for making gravy with what is left in the pan. A heavy roasting pan, superbly made and very well finished. From roasting the meat in the oven to finishing the gravy on the hob the heat is transferred evenly. Five stars! Perfect for the XMas roast! 565 customers found this review helpful. Did you? Yes, I did! This is a really solid pan and will not distort with the heat in an oven like cheap pressed pans tend to do. Once the joint is roasted, it is superb for making gravy from the meat juices on the stovetop. Cleaning the pan afterwards is a breeze - you leave some soapy water to soak for an hour or so and it comes up bright and shiny without endless scraping and scouring. We like using this so much for sunday roasts that we are thinking about ordering another one for roasting potatoes in! 529 customers found this review helpful. Did you? Yes, I did!